Rainer Security Products Ltd. was created in 1988 as a family business to supply the Arrow Interchangeable Core Masterkey system and related products. The unique feature of having a key as a tool to provide a quick change facility in the event of an operating key being lost or stolen makes it an ideal product for use in areas where masterkeying is essential or desirable. After all, you do not need training to operate a key, thus and effectively complete a lock change in just 10 seconds! Many Housing Associations, Local Councils, Universities and Schools, Hospitals and other establishments enjoy the benefits that can be realised from the use of the speedy, effective and low cost interchangeable core system. A POTTED HISTORY OF RAINER SECURITY PRODUCTS LTD.
Rainer Security Products Ltd started out in 500 square feet of converted garage and workshop in the basement area of shops/offices in Arun Street, Arundel, West Sussex. It was ideal at first as a compact facility for office, storage and assembly – but it couldn’t last! The uptake for the product range and the need to continue to supply a good service meant that bigger premises were required. 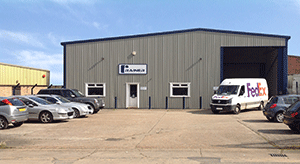 Our search took us just a few miles from Arundel to a compact industrial estate in Ford where we purchased in 1994 an existing unit giving us just over 1000 square feet. Room to move around, efficiently laid out assembly area and greater storage facilities served us well and a further 700 square feet were added. More products related to our main business were developed by us, additional products were brought in and our customer base grew, – yes, so did our need for more space. Within the same industrial estate we found our present home in 2003, with about 5,500 square feet available, we were able to provide a spacious working environment for all staff. Improved storage facilities and workshops layouts have given us more opportunities to handle more new, and some unique products which we hope to add to. In particular are products to meet an increasing demand for patent protected keying systems. Customer service and satisfaction continues to be a top priority and our staff, most of whom have been with us a long time, subscribe wholeheartedly to this philosophy. AND SO THE HISTORY POT IS FULL. NOW WE LOOK TO THE FUTURE!